Few days back we reviewed Advanced Device Locks that can be used to lock SMS and other applications in a Symbian mobile phone . But ADL was a shareware mobile software and you need to pay after few days of use .Here is another application called Active SMS Lock that can lock SMS messages in Nokia and other Symbian devices . Download Active SMS Lock . 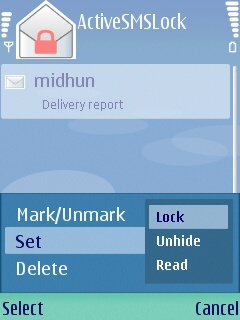 As you can see in the screenshot , Active SMS lock can lock SMS in inbox , Drafts ,Outbox and other SMS folders . 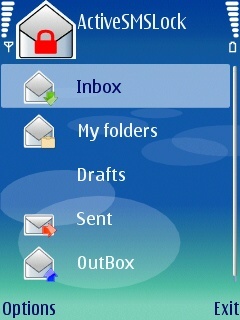 Open Inbox /required SMS folder > Select SMS and then lock as shown in screenshot ( Default PIN code is 12345) .Active SMS lock is completely free and can be installed in following Symbian devices . Nokia 3250, 5500 Sport, 6290, 6650 T-Mobile, N71, N73, N75, N80, N91, N92, N93, N93i, E50, E51, E60, E61, E61i, E62, E65, E70. Download SMS message lock . These applications are already signed . If you are getting any error messages , You can use this method to sign mobile softwares. We specialise in all new mobile phones, including Samsung, Nokia, Qtek, if you have, Palm Treo, Sony Ericsson, Sidekick, Nextel and many more that are cheap and unlocked with 12 months international warranty.We sell in bulk and Retails, deliver inconjunction with FedEx Express, which shipped in 48hrs to your door. It is a Buy two and get one for free. These mobile phones are completely new phones with all its accessories and carries full 1 year warranty. you could try “Private call&sms guard”, lots of functions include hiding and encrypting the private informations like SMS/call log and files. when i download it for n73…. Our free sms solutions allow you to send and receive sms online, you just logon, then start sending sms messages directly from the free sms online interface. i not able instal.i am using n79 nokia. m getting error certificate expired pls. help me.